Playlist doesn't seem to be going away, and while landing on Spotify curated playlists may seem out of reach, their hardly the only option, with user-generated playlists often having hundreds of thousands of followers. Here we look at what artists need to do land spot on one of these coveted lists. What’s your band’s niche? Not genre, but the factors that make your music unique, and your brand diverse. It’s estimated that less than 5% of musicians actually make a living in their craft and that 90.7% of all artists are undiscovered, 6.8% are developing, 1.4% are mid-sized, 0.9% are mainstream, and only 0.2% are considered megastars. In a sea of endless undiscovered talent, the bottom line is: It’s hard to get noticed. So… how do you get recognition for your music? Before the musical masses recognize you, you need to recognize them! Understanding your fan base is your most important task. It determines every factor that will be used to popularize your brand. Defining your avatar, your one perfect customer, is crucial towards marketing and promotion success. Without knowing who your customers are, you’re advertising to everyone – and therefore no one. There are many great templates online that help create your ideal customer persona. Be sure to revise this as your musical career progresses and your audience grows. Assuming you have very relatable, unique, and professionally crafted music that has been professionally mastered and the potential to sell, there are many more steps that need to take place before you can start earning money for your work and make a place for yourself in the music industry. If nothing is being done to promote your pre- and post-release, your music won’t sell. Promoting is the most vital, yet most misunderstood process to self-releasing artists. Once your masters are delivered from your mastering studio and are off for distribution, you should never sit patiently and wait until they are “out now!”. In fact, you should have been promoting and preparing for your release well in advance. Professional bands and labels have BIG teams to organize and promote their associated product. Some of these teams consist of advertising and marketing teams, sales teams, personal managers, business managers, publicists, booking agents, accountants, attorneys, A&R, graphic artists, designers, copywriters, radio and broadcasting companies, amongst many more various job titles and collaborative corporations. All of this is operating as a machine to sell an artist’s recorded material. This may sound like a daunting task for a self-releasing artist, and it is, but wearing most of these hats can and has been done. A lot of time will have to be given to learning the skills of these trades, but the reward can be well worth the effort. We will provide you with some great ways to get your music heard! Before the release, promote your shows! Get people interested and promote your content release by planning show dates. Your show campaigns should be advertised about 4-6 weeks before the event. Take action as soon as possible and start planning your campaign! Give local press a heads up. Months before the show, let your local press know! 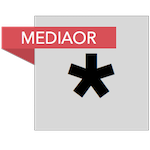 Give them the date, door and show time, venue and address, the age limit (if any), and include a link to your recent music, and social links in your email signature. Invite the promoters a few weeks before the show and make fun and engaging promotion events like a raffle to give some tickets away to your promoter’s audience. A great poster can go a long way. Knowing where your fans hangout is key to poster advertising. Using your avatar description, head to all of the places that would attract your fanbase and put up those posters! Go the extra mile and hire a professional to take at least a few great photos of your band that you can use to promote your shows. The photos will not only look great, but one photo session can last you months or even years of great and diverse content! Use a Facebook pixel for optimized advertising to your truest fans. Make sure your fans never miss a show! A Facebook pixel is a piece of code that’s placed on your website (if you don’t have a website, make one … now!). This code will help your Facebook advertising campaigns direct your ads at the people who are most likely to take action and click on your ads (those who visited your website, bought your products, etc.). It’s a smart way of promoting content and increasing your CTR or click-through rate (percentage of people that click your ad when it’s presented). Make the show more exciting – give people a reason to see you. Treat the show as an event rather than just a performance. It could be a music release party, tour kickoff, fundraiser, or birthday party. This technique can definitely help fill up your calendar when trying to book shows. Everyone wants to go to an event! Now it’s time to promote your content! You’re getting more and more of an audience at your shows and your music is scheduled to release soon. Time to start your release campaign! Getting your music onto playlists is a great way to boost streams so other playlists and businesses will take your content more seriously. Think of it as planting a seed. One playlist can grow to two and suddenly you could be on ten, which then leads your music onto a multimillion listener playlist, which will broaden your music even more and your seed-turned-tree will continue to grow and expand. Remember, having a great and competitive sound is just as important as getting onto these playlists. Your mastering engineer will make your music sound its best while translating to these playlists on a more competitive level. If you don’t have a mastering studio yet, most reputable mastering studios offer a free mastering sample of your music and will create professional masters that are ready for Spotify distribution. Spotify playlists are extremely competitive. Most of the popular playlists are either owned by big record labels or Spotify. Indie labels and other companies own some, and then personal users like yourself own the rest. A lot of the songs that make it onto big Spotify playlists have first been played on smaller ones. Which means you’re going to have to make your way up the pyramid. Spotify data analyzes plays, skips and finishes to determine how the song is appealing to its audience. If it does well, you have a better chance of staying on the playlists longer. 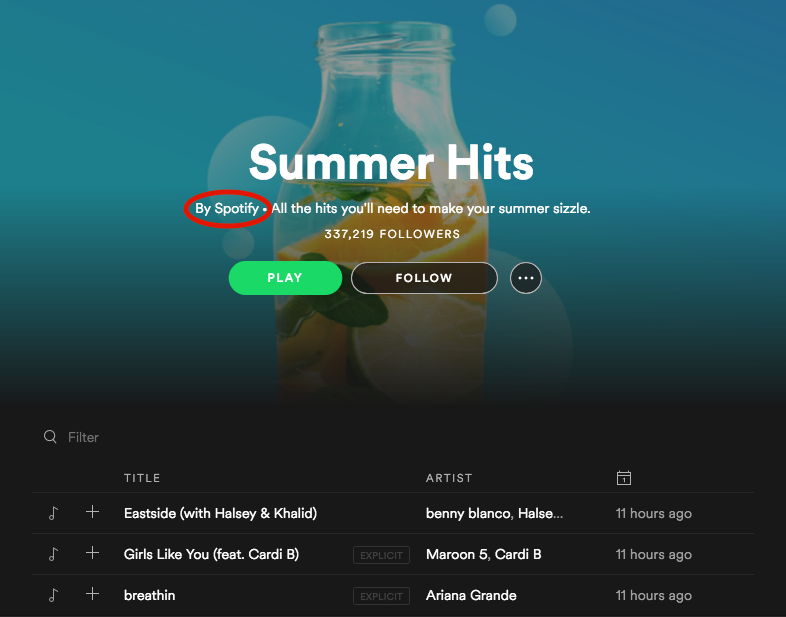 Summer Hits playlist created by Spotify. You will find that some of the most popular playlists are created by Spotify using their users’ data analytics. Major labels even own playlists to get their artists to a greater audience by getting enough plays and popularity to become featured on Spotify generated playlists. Sony owns Filtr, Warner owns Topsify, and Universal owns Digster. Other companies that own playlists are indie labels, big radio stations, and popular music bloggers. An example of a well-known user-curated Spotify playlist. This will get you verified as an artist on the platform. You’ll have access to analytics tools and notifications when your music is featured on new playlists. This step is vital. Pay attention to trends and how you can improve your brands advertising campaigns by seeing what gets you more streams/followers and what doesn’t. 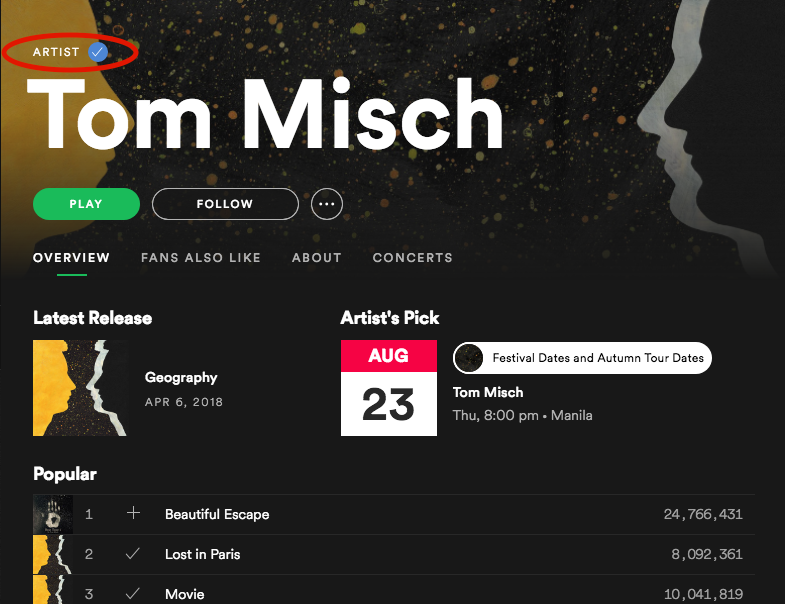 A Spotify artist verified account will have a checkmark next to the artist’s name. Share, share, share…and keep the buzz going! Send links of your music to your followers on social accounts (keep in mind of Spotify’s skip and finish analytics – maybe direct them to your page so they don’t get a snippet of audio through another platform and move on). Single releases can help gain long-term traction, as the music industry is shifting into a more single-oriented market. Use your photo session pics to promote your music. A great photographer will tell you to bring multiple outfits to the session and will take various pics at different locations or with different backdrops to create a variety of photo content relating to your brand. These photos never get old to your audience if they are slightly different from one another! The average Instagram post for businesses is about 1.5 pics a day. So make sure to take a lot during sessions and keep on posting! Tips for maximizing your time and organizing your business. The amount of technology that we have available to us is mind-boggling. When used to its greatest potential, it can help make your life easier and more in control of your brand. Reach greater audiences by implementing these techniques. Stay organized and on task. Small steps will add up! Have your songs mastered by a professional mastering studio to ensure they are properly prepared for Spotify distribution. Have a centralized calendar on your phone. Keep everything in one place (drawing info in from multiple calendars/apps) that can be accessed and modified by your bandmates, managers, agents, and anyone else on your team. Use a CRM (Customer Relationship Management) to keep track of your sales records (online purchased concert tickets, music, merchandise) and create a list of everybody who has bought your products. You can use this given data to better understand your fans and sell your music much more efficiently. You can use the CRM’s highly organized information to better plan show dates by seeing where your fans live. You can even make reminders to follow up with people like playlist curators using customized templates to keep you consistently reaching out, fast! Integrate your tasks and goals into an app that you can use every day to stay focused and on task! Make newsletters to inform your fans about your local shows, upcoming tours, new music, merchandise for sale, and everything else (keep information easily managed with your CRM). Use an app like Calendly to send meeting invitations, giving the invitee the ability to choose the time (based on your calendar availability) and other various options you can customize. Which makes planning a meeting super easy! There are so many outlets to gain musical popularity. You can reach out to music bloggers that create and provide playlists, pitch your songs to playlist curators, and even make your own. Support all of the playlists you’re on and keep on reaching for more. There is no one successful way to get featured. You just have to work hard and promote your brand in every unique way you can. Organizing your brand’s marketing campaigns are key toward long-term success. You need to understand the analytics you receive and work with them to gain a better understanding of what works and what doesn’t. Remember, businesses hire many teams to accomplish what you are wanting to do. Treat your brand in that sense and take credit for your hard work by setting small goals and rewarding yourself for what you accomplish. If it gets too overwhelming, look at hiring other experienced professionals to help you. The more time you apply to working with and learning how to promote your music, the better off your music will be! Keep on hustling!